The Lexmark MX811de MFP with a customizable e-Task touch screen, 500-sheet offset stacker, 1,200-sheet standard input, 1GB of standard memory and 160+GB hard disk provides print, copy, fax, scan and email functions. The Lexmark MX811dfe MFP with a customizable e-Task touch screen, staple finisher, 1,200-sheet standard input, 1GB of standard memory and 160+GB hard disk provides print, copy, fax, email and scan functions. The Lexmark MX811dme MFP with a customizable e-Task touch screen, 4-bin mailbox, 1,200 sheets of standard input, 1GB of standard memory and a 160+GB hard disk provides print, copy, fax, scan and email functions. The Lexmark MX811dte MFP with a customizable e-Task touch screen, 500-sheet offset stacker, 1,750-sheet standard input, 1GB standard memory and 160+GB hard disk provides print, copy, fax, email and scan functions. 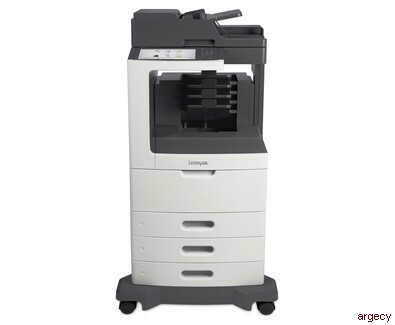 The Lexmark MX811dtfe MFP with a customizable e-Task touch screen, staple finisher, 1,750-sheet standard input, 1GB memory and 160+GB hard disk provides print, copy, fax, scan and email functions. Leasing Available from $95.55 per month! Leasing Available from $106.21 per month! Leasing Available from $101.21 per month! Leasing Available from $108.35 per month! The Lexmark MX811dtme MFP with a customizable e-Task touch screen, 4-bin mailbox, 1,750 sheets of standard input, 1GB of expandable memory and a 160+GB hard disk provides print, copy, fax, scan and email functions. The Lexmark MX811dxe MFP with a customizable e-Task touch screen, 500-sheet offset stacker, 2,750-sheet input, 1GB of expandable memory and a 160+GB hard disk provides print, copy, fax, email and scan functions. The Lexmark MX811dxfe MFP with a customizable e-Task touch screen, staple finisher, 2,750-sheet standard input, 1GB of expandable memory and 160+GB hard disk provides print, copy, fax, email and scan functions. The Lexmark MX811dxme MFP with a customizable e-Task touch screen, 4-bin mailbox, 2,750-sheet standard input, 1GB of memory and 160+GB hard disk provides print, copy, fax, email and scan functions. Leasing Available from $106.68 per month! Leasing Available from $114.12 per month! Leasing Available from $114.15 per month! Leasing Available from $108.95 per month! Leasing Available from $120.61 per month! 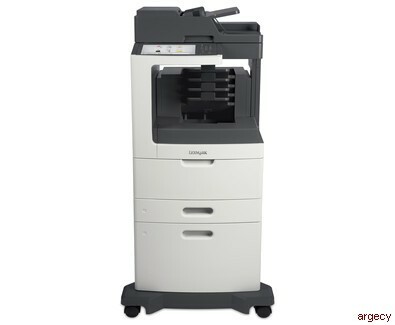 Looking for Lexmark MX811 Parts? With 2-sided printing and the ability to print on diverse materials, you can do more for your business. Choose the options you like to build the solution you need. Height - 9.6" / 14.9"
44.6 x 26.1 x 28.9 in. 52.24 x 34.25 x 30.0 in. Multi Send lets you capture and route a document to multiple destinations simultaneously and print a copy if you choose. Documents can be routed to email, network folders, FTP sites, or to a remote Lexmark printer.